In San Francisco for the American Academy of Dermatology Meeting where physicians line up for miles for samples of OTC creams and bottles of Dove. 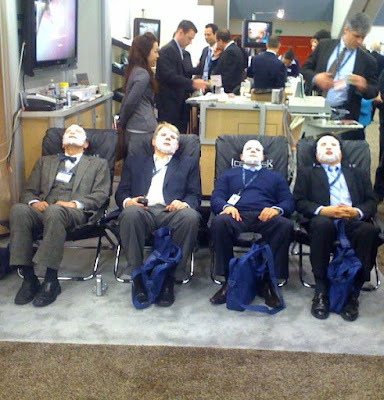 Most of the convention center looks like a mall, but there are some exceptions: The best-dressed man at the conference - a French doctor - and three guys sat down for an ice facial (designed to help speed things along after facial nips and tucks). I used to work at this convention for five years straight. Its the best handout for xmas stocking stuffers without doubt. Oh the funny stories I can tell of us grabbing everything in sight. That is so, so funny!